Fmr. 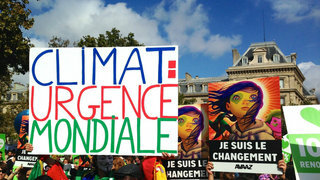 Irish President Mary Robinson Calls for Global Climate Justice Fund | Democracy Now! former president of Ireland who now heads the Mary Robinson Foundation–Climate Justice. AMY GOODMAN: Ambassador Pablo Solon is the Bolivian ambassador to the United Nations, speaking with us here in Cancún, where former Irish president Mary Robinson also spoke this weekend, talking about the need for a global climate fund that will help poor people protect themselves from the growing threats of global warming. Robinson is the honorary president of Oxfam International. She recently launched the Mary Robinson Foundation–Climate Justice. She spoke Saturday on a panel about climate change. MARY ROBINSON: I believe that this is the biggest human rights issue of the 21st century, and I believe that it’s a way of addressing issues of development and issues of tackling poverty. It’s not just an issue of the impact of the lifestyles in the richer parts of the world, the profligate carbon-based lifestyles that are undermining the lifestyles in Constance’ world. It’s also an opportunity for new values and a change in our lifestyles and a whole approach that I hope we can really bring home as being a better way to live with the earth that should nourish us and our children and our children’s children. I could talk for a long time about the need to understand the human rights dimension, but also the fact that the justice that we’re talking about is in essence a justice of ensuring that the poor, the poorest and the poor, have a right to development. We have marked the 25th anniversary of the Declaration on Right to Development, and that development must increasingly be access to affordable, renewable energy for the poorest. Solar, batteries, lighting, clean cooking, clean water — all of these exist, and they exist for 100,000 people here, a hundred villages there. Social entrepreneurs have provided many responses to these possibilities. And yet, Constance cooks by moonlight. The mobile phone is the technology that has transformed many lives in developing countries. We have to ensure that it’s not just the mobile phone. It is, in fact, affordable, renewable energy, so that the poor can be better at adapting to the negative effects of climate, but also bringing themselves out of poverty. So, the challenge is a human rights and development one, but it’s also a justice one. And that’s what we have to get across here at COP16 and beyond. AMY GOODMAN: Mary Robinson is the former president of Ireland, the former head of the High Commission on Human Rights, now runs the Mary Robinson Foundation. She was here speaking in Cancún, Mexico, where Democracy Now! will be broadcasting all week, the only daily grassroots global news hour that is devoting this week to the U.N. climate change summit, as we approach the end of the warmest decade in history. You can follow our coverage. You can re-tweet it. You can follow us at democracynow on Twitter. You can follow us on Facebook at facebook.com/democracynow. And you can go to our website at democracynow.org. There, we have video and audio podcasts. The transcript of every single interview we do is there.